For those of us who don't go on climbing trips often, or who aren't lucky enough to live close to major climbing areas, it's important to make the most of every minute you're out. After a fun and successful ice climbing weekend in the Adirondacks, it was obvious that there were things we all did or attitudes we had that made it a good trip. Here are my top six, and feel free to add anything I've missed in the comments! Be ready to teach. If you've climbed before and have a relative beginner in the group, it can be a great opportunity to make sure they come away from the trip not just having had fun, but having learned something. And teaching can be one of the best ways to make sure you know what you're doing yourself! 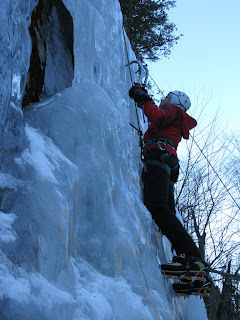 We had a first time ice climber in our group this past weekend and three of us worked to give her a quick belay lesson. She picked it up quickly and did a phenomenal job. Now, she'll be able to belay test at any climbing gym, and be a more able climbing partner. 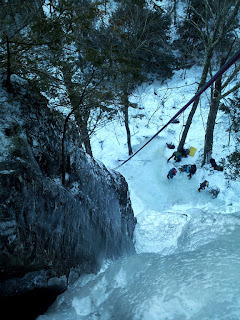 Dan looking down from the top of Ice Slot (WI4). This generally goes without saying, but communicate about everything and pay attention. With ice climbing in particular, it's so important to keep communication lines open for safety reasons. 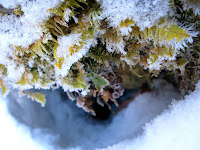 Ice is impermanent; it chips, it breaks, and it falls. We used the "beer can rule" to decide when to yell "ice!" if a piece was falling. I got hit on the elbow by a baseball-sized piece while I was belaying and have a grapefruit-sized bruise, but because my climber warned me and I was watching, I was able to prevent it from landing on my head. We even had a climber in the group drop a tool 3/4 of the way up a tall route, but because of effective communication, the only casualty was a plastic water bottle. If you're going with a big group, it's also important to communicate about everything before and after you head out. George did a fantastic job getting us organized, making sure we had a departure time set each morning, and making sure we knew where we were going. If we didn't have a clear start time, we'd have had a lot of trouble getting as much climbing in as we wanted to. on one of our climbs in the Loch Ness area. Have comparable goals and objectives. If everyone in your group isn't on the same page about what you're hoping to accomplish, it can be a challenge to have a good day out on the ice. We had nine people in our group, not including the two we met up with each morning. I knew I'd probably only get a few climbs in each day and that there would be a lot of standing around. If any of us had gone into the trip hoping to get ten routes in before lunch, or climb a multi-pitch route, we would've had a problem. Be considerate of other groups. Good ice is a valuable commodity, particularly with the warm winter we've had so far. If you're headed to a popular area, know you're likely going to run into other groups and share. 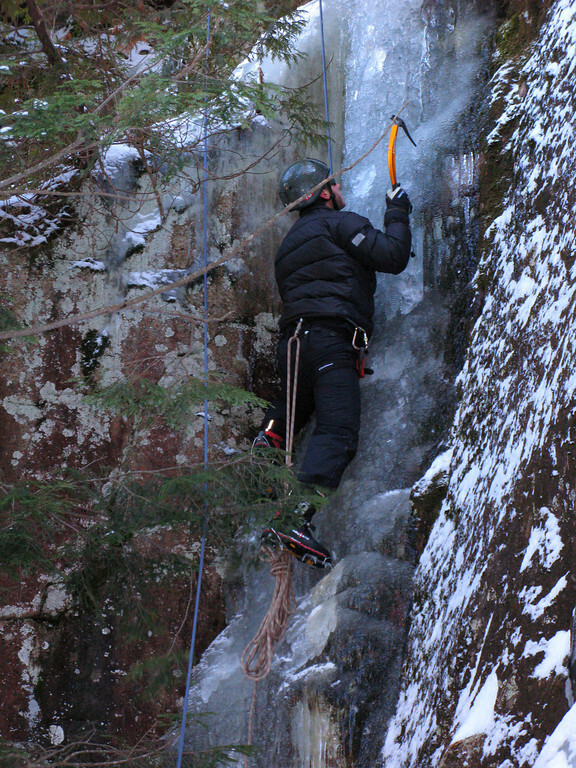 With our group of nine headed to Chapel Pond on Sunday, we knew there would be other climbers there vying for space. It didn't hurt that the weather was absolutely perfect. After one of the lead climbers in the group set up our first rope, he made sure to let groups know we'd stick to one side of the area and leave other nearby routes open for them. Don't forget to look around and enjoy the scenery. If you're going ice climbing, odds are you're going to be in a pretty spectacular setting. I know I'm guilty of focusing too much on the objective of the day and not enough on where I am. The Adirondack region of New York is a stunning place, and I tried hard to remember to take in as much of the view as I could while I was there. Some of us went on a short jaunt while others were climbing near Chapel Pond on Sunday both to scout other climbing spots and to stay warm. While we were out, I remembered one of the 31 Days of Adventure prompts and focused on noticing everything around me that was green. I was surprised at how many green things I noticed, even in the dead of winter. Do you have any other pieces of advice for making the most of a climbing trip? Great post and photos! Your last point is one that I find myself having to be reminded of quite frequently. Tunnel vision can set in so easily at times. Thanks, Patricia! Agreed, the last point is something I need to be more aware of on all of my trips. Getting outside in beautiful places is half the fun!